"here comes the Great Band / Group again!" 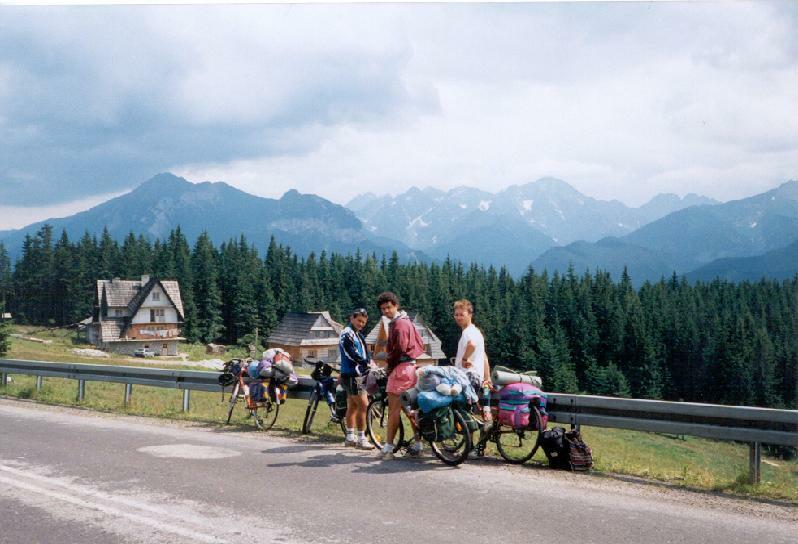 After our last bicycletour to the Tatras in 1997, in the following year I started to plan our fourth tour together. Last year, in 1997 we didnt visit Krakkow, East-Slovakia, and cancelled the raft-tour on the Dunajec river and cycling up to the Morskie Oko lake, but enjoyed the beauty of the Vratna valley, Spisské fortress and I get acquainted with the steep climb at Krasnahorka and I was on the peak of the Rysy. After speaking with the two other guys I defined the route in that way that we would be able to visit more and more nice areas, towns. Contrasted with the direction of our tours before I planned to cycle Slovakia around in the opposite direction: at first crossing the Low Tatra, then - after visiting Krakkow - to arrive at the Tatra on its east side. After some days I liked to cycle to East-Slovakia where we could to visit Bardejov, Kosice and geyser of Herlany. It seemed to be a tradition-breaking tour with full of unknown places. For the first day to our meeting point at the Bükk-plateau I chose a route where I hadnt cycle for long. To Gyöngyös I didnt have to climb any serious climbs, but from there I ascended up to Mátraháza, where from I could roll down 20 km long to Recsk. I needed some efforts to climb the ascents between Sirok and Eger, so it was good to rest in the center of Eger for an hour. The last ascent of the day went up to the ca. 700m high Bükk plateau. At the end of the day - after about 200 km - I could meet with the two friends of mine and an other guy in Répáshuta. It was a good feeling to meet and to be ready for a tour with them in Slovakia. We started cycling in cloudy and a little bit rainy weather, but when we made a short stop in front of the Palace Hotel in Lillafüred  from where we could see the lake too - we could already see the light sunshine. This time we continued our tour not towards the hills, mountains of Aggtelek and the Cserehát, but we turned towards a serious climb to Ómassa. This route was shorter, but a little bit harder than the other. The 10-14% steep ascent at Ómassa where to we had to cycle was unexpected. After climbing it, we could turn onto a light, almost flat but very bad conditioned forest-road to cross the Bükk mountain-range. On the bumpy road we could cycle slowly, so we had time to enjoy the beauty of the nature and to breath fresh air. After leaving the Bükk, from the climb after Dédestapolcsány there was a nice view back to the mountain-range. In the last hour before the border we were pushing the pedals on a main route. The weather wasnt warm, we had to face with cold wind. In Slovakia we were going under grey clouds, fortunately we had only a short rain. Just before the first climb of the Lower Tatra we found a nice place for our tents. Our last thoughts were about the football world championchip final between France and Brazil. We woke up for a beautiful, sunny and warm weather. We couldnt be able to wished for better. Our first climb went through a shady forest, along a steam. It was atmospheric. On the slope, when we went out from the forest we got a nice view to the whole range of the Lower Tatra. The next  steep - ascent after Brezno was only 4 km long, but very beautiful. On its lower section the road went between healthy, high fir trees, then with turning back we could see the kilometers behind us, and from the top there was a panorama to the mountains of the Lower Tatra, like: Chopok, Dumbier and the valley towards the Certovica pass. After some food I spoke with the guys that I would make an about an hour and a half long lay-by to the Tale valley in front of the peak Chopok. I were there last time in 1998 with my family. We had nice excursions there. The lower section wasnt hard, but about 2-3 kilometers before the end of the road (1216m) I decided to take down my packs and go on cycling without them. I hid them to between bushes. After reaching the top I was cycling to my tourmates with hurry and with a little bit twinge of conscience. At the end of this hard day we had to climb up to the 1238m high Certovica pass. The ascent was about 8 km long. Without any good place for the tents we got place to sleep in a container-room. After lunch we talked about our days in a restaurant, where we could hardly believe the result of the football championship final (France beat Brazil by 3:0). As we had seen on TV the weather-forecast in the evening, we woke up for a cloudy weather that promised rain for us. On the slope we could roll down on the dry road, but we arrived at Liptovsky Mikulas in rain. From the shore of the Liptovsky lake the route I planned went to between the mountains which were partly covered by clouds. I didnt have any information about the climb, so it was a surprise that the 10% steep section "didnt want to change lighter. On a beautiful day it would be wonderful road with views to the Liptovsky lake. In every occasion I tried to find something that I could enjoy: that time it was that I didnt feel cold because of the climb. In Zuberec we found accomodation to sleep for a good price. It was good to change our wet clothes, to get a hot shower and to feel the warm of the radiator. We started our sunny day in the skanzen of Zuberec. It was worth seeing it not only because of the houses, and the museum, but because of the fir trees, the stream and the land. We arrived at the polish border on a known road. We set up our tents close to the Tatra, at a stream, next to fir trees. 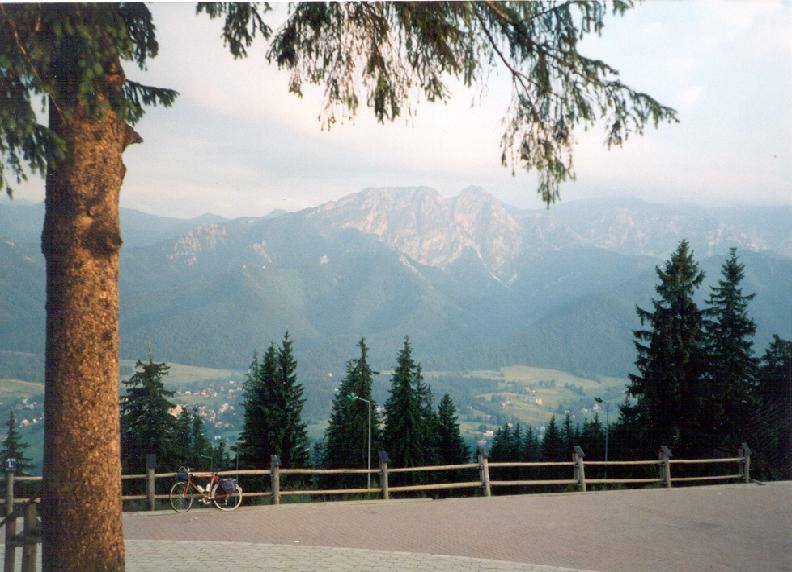 To exploit the remaining 2 hours before sunset I cycled to visit the 1100m high Gubalowka viewpoint above Zakopane. It was nice to look down to the houses of Zakopane and the rocky mountains of the Tatra in sunset. Although the centers promenade with the tourists, selles, music and lights was very atmospheric I had to hurry back to the guys and our tents. We woke up for an other nice morning. Despite the morning we found a lot of leople in the center of Zakopane. The sellers offered everything, but mainly traditional things. Two girls sang folk-songs. 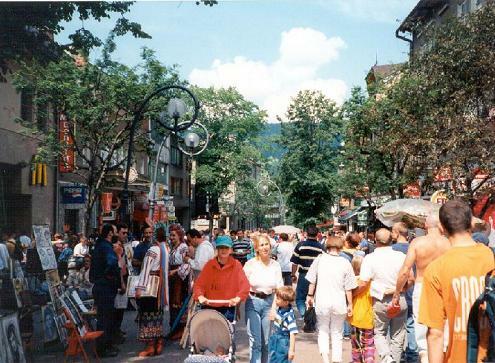 Although we had been twice in the Polish-Tatra (1995, 1997), that was the first time, when we could enjoy its beauty. In 1995 and 1997 we had rain there. After Poronin the road ascended gently to a traditional folk-village, Tatranska Bukowina and then to the Glodowka-meadow. I saw a picture about this place, thats why I wanted to go there in every case. The panorama was fantastic: from the East-Tatra though the famous Kasprowy and Giewont to the Rysy. This time we got the bad weather on the slovakian side of the Tatra. 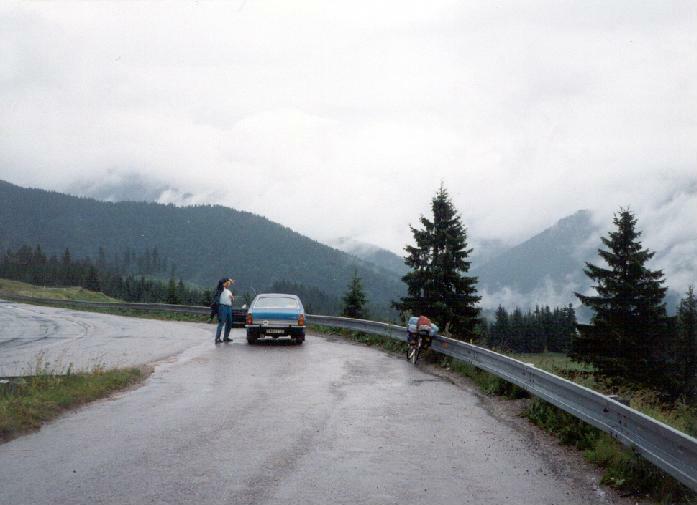 It seemed if we cycle on the side of the Tatra from Slovakia to Poland or backwards we couldnt avoid the rain and cold. We slept in a private house of Nova Lesna again. We had to pay 200 Sk / person / night for it. In the morning there was some rain, but in the afternoon the clouds broke, so I decided to take a cycletour. First I was pushing the pedals up to the Strbské pleso (lake), then  as I saw that towards south-east the sky is cleaner  I went back to Poprad and turned to the romantic Slovensky Raj.That was the only one ascent of that mountain-range that I hadnt cycled before. The climb was light to the last 2-3 kms, so I could bike at a good pace. I had already known the main road towards Stratena, so it was a good feeling to cycle there again. I was indulging in nostalgia. Last time I was there in 1995, 3 years ago. With a small pack (about 3 kg) the 1 km long and 12% steep climb to the 1056m high "Doghill  we gave its name  wasnt a problem. I couldnt be tired. On the slope I was cycling with hurry because after the two small climbs I wanted to come out from the forest before sunset. I liked to see the Tatra in sunset. Although I didnt succeed it, I had a nice, 150 km long tour. Next day we already continued our tour. We planned a light, short day: we had to climb only a not too high mountain to reach the river Dunajec. We said goodbye to the Tatra. About a day before we had spoken that three of us will take part in a raft-tour on the Dunajec, but at last it was me, who remained. It was an experience! The raft was made of 5 wooden digged out block, on which planks were taken. The people had to sit onto the planks and in the blocks. There were 20 of us in that raft. Onto the front of the raft branches were taken to save us from the water that sometimes bang against the raft. The raft was guided by two piskmen. One of them in front, the other at the back of the raft. I was travelling in a raft that was full of slovakians. After the first kilometer the Dunajec  and we also  turned under the high rockwalls of the Trzy Korony. The first pickman sab skilfully the grappling hook into the water and directed the raft well. The river twisted through in a nice canyon, between high rocks. The people in the raft were singing slovakian folk-songs. After the tour we were taken back to the departure by a bus. On our next day we woke up early. As we saw that the weather was humid and a raincloud was coming we decided, it would be better to find a better place if it started to rain. After an hour we left the mountainous land of Slovakia on a light ascent. At a small village we saw girls and women dressed in folk-clothes. At first we didnt know why we find every shop closed, then we got to know, it was holiday. Is was a surprise that in front of the fortress of Stara Lubovna there was a view to the High Tatra. The other surprise didnt give me happyness: because of a fault in manufacture a wire had broken in my tyre: how long would the tyre last? The road on which we were cycling to east went along the polish border. Bardejov was a very atmospheric, calm town. 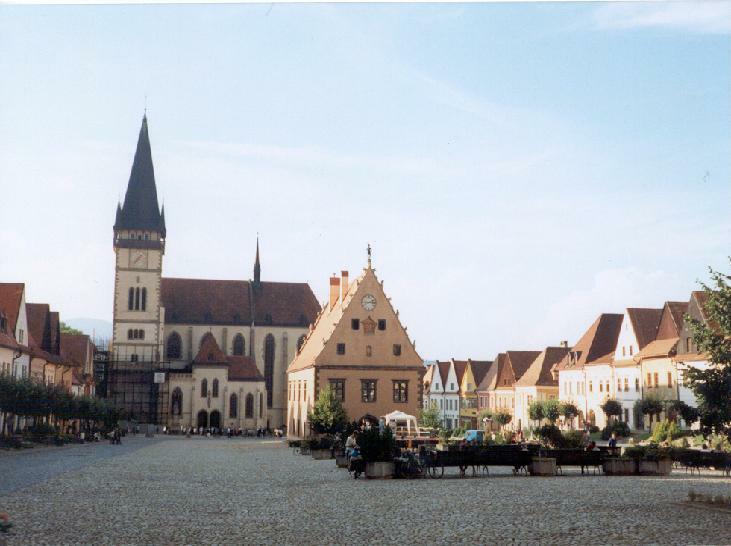 Its old main square with redecorated houses, with the church and the town hall was unforgettable. On the temporary stage youngs were playing very pleasant music. Next day we were pushing the pedals between more and more lower hills towards south-east. We couldnt avoid an other rain that day either. After the short shower we swam in a bathlake. Next evening we planned to set up the tents nex to Kosice. We was cycling on a flat road to the feet of the mountain-range, situated north-east from Kosice. On the shady climb to the 520m high pass we hardly met any cars. Because there was warm under the sun, and I felt a little bit tired, I enjoyed to sit in a shady bank and to hear the voices of the forest very much. Using a pen I draw onto the map our route that we had already left. At Herlány we visited the well built geyser, that erupt in every 34 hour, but we didnt want to wait for half a day. We arrived at Kosice on a sunny and hot main road. The personell of a petrol station were so nice to let us to have a shower. Kosice was such a nice city, that I would rank it among my most favourite towns, to between Banska Bystrica and Bardejov. The center is ordered, clean and is full of flowers. The houses in the promenade are redecorated. In the middle of the main promenade there is a theatre, next to it a fountain in a small park. The water of the fountain erupts for the voices of music. That is an other place where people can spent a lot of time. We liked the center so much, that we decided to go back next morning. Next day our last task in Slovakia was to spend our last slovakian money. Arriving at Hungary we slept next to Jósvafő, at te shore of a lake at the edge of a forest. We didnt need our tents, we were sleeping in our sleeping bags, under the sky. Unfortunately our day before the last became my last day, because after my first puncture at Putnok, 1-2 hours later at Szarvaskő I got another. It couldnt be repaired, I didnt want to buy a new one, so I arrived at home by train from Eger. Despite the bad end of my tour and the lot of rain that could be my best Tatra-tour. During the 13 days I cycled 1367,65 kms and climbed 11720 m heightdifference. The costs (the photos are not counted to between it) remainded below 25000 HUF. To the people who want to visit Slovakia I suggest to visit  besides the Tatra  Bardejov, Kosice, the skanzen of Zuberec and the pass between Zuberec and Liptovsky Matiasovce and the other next to Brezno towards Myto pod Dumbierom. They shouldnt miss the raft-tour on the Dunajec river too.